The Arab American Cultural Center of Oregon promotes the richness and beauty of Arab culture via community events, festivals and family entertainment throughout the calendar year. AACCO sponsors its own events, and also lends support when possible to existing Arab culture activities held in the Portland Metro Area and the Pacific Northwest region. Join us September 1st at Oaks Park! Join us as we celebrate our Arab heritage with live music featuring the amazing Raid Alasmar and other musicians from the Arab world, dabka, a Souq (Bazaar), Middle Eastern cuisine, henna, games, dance, poetry, networking opportunities and much much more. Kid friendly environment: Carnival games, face-painting and much, much more! 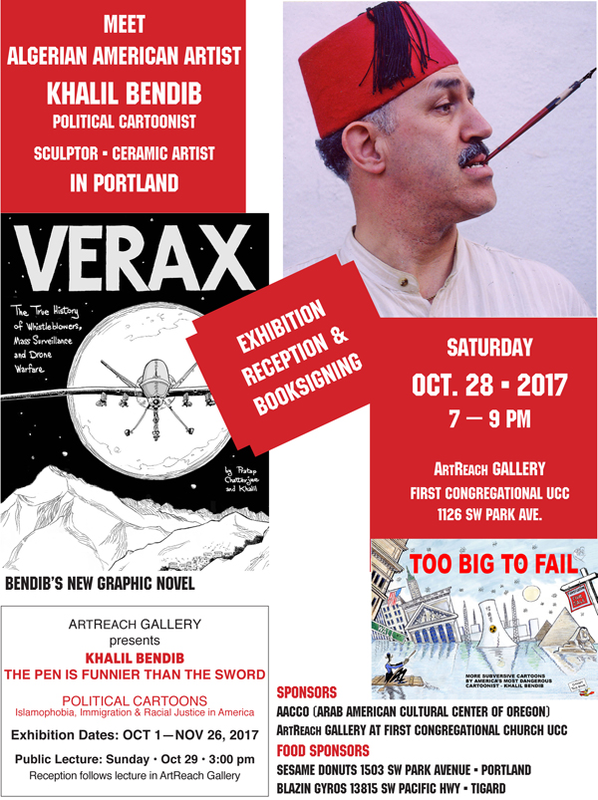 Join us October 28th to meet internationally-known political cartoonist Khalil Bendib. Bendib will show slides from his newly published book VERAX, a graphic novel on whistleblowers and will be signing copies of his new book. The courageous and humorous Bendib also co-hosts a radio program in Berkeley on the Middle East. His cartoons are on display in the ArtReach Gallery of the First Congregational Church UCC, where the reception and book signing are on Saturday, October 28, 2017 from 7 to 9 pm. The cartoons of the award winning artist have been published in major newspapers including the New York Times, USA Today, the Los Angeles Times and the San Francisco Chronicle. They are also featured weekly in dozens of small and mid-sized newspapers nationwide, the artist having decided to distance himself from corporate mainstream media. We hope to see you there!